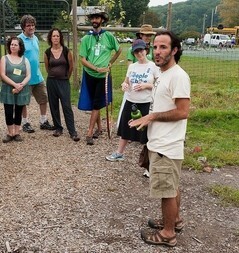 Simcha Schwartz, co-founder of the Jewish Farm School, served as Co-Director and Associate Director from Jewish Farm School's founding days through 2011. His work was essential in the development of Jewish Farm School's Alternative Break department and farm programs at Eden Village Camp. Simcha supported our mission through hard work, determination and great vision. Simcha has directed programs for Hazon Inc, American Jewish World Service, Teva Learning Center, Wilderness Torah and Eden Village Camp. He currently serves as a Hospice Chaplain for Vitas Healthcare in Oakland, California and, in 2018, was ordained as a Reverend & Interfaith Minister from The Chaplaincy Institute. Most recently, Simcha has become the Board President for Wilderness Torah and the new manager for the Jewish Community High School of the Bay's Varsity Baseball team. Simcha can be contacted at simcha.education@gmail.com.